• Overnight in a permanent tented camp on a high ridge above the Tarangire river where elephant and buffalo come to drink. • Sundowner overlooking Lake Manyara. • Visit to a Maasai homestead. 27 Aug: Tarangire National Park. Tarangire Safari Lodge. 28 Aug: Tarangire National Park. Ngorongoro Highlands. Tloma Lodge. 29 Aug: Ngorongoro Crater. Lake Manyara Region. Isoitok Camp Manyara. 30 Aug: Lake Manyara Region. Arusha. Kilimanjaro International Airport. Tue 27th Aug: Tarangire National Park. Depart Mbahe at 8 am for the drive to Tarangire. Picnic lunch en route. Picturesque Tarangire National Park, the “Baobab Capital of the World,” is known for its wild landscapes, resident elephants, large pride of lion, leopards, giraffe, buffalo, the last remaining pack of wild dogs in northern Tanzania, and excellent year-round bird-watching with more than 300 bird species. The Tarangire River is the only permanent water source within the 2,600 square kilometer park. During the dry season herd animals of all kinds (wildebeest, zebra, gazelles, and antelopes) migrate from the surrounding areas to this life-sustaining source of water. Also in the dry season, the amazing giant rock pythons leave the swamps to live in the trees at the swamp edge, from where they will attack and kill large animals of all kinds, providing a most unusual natural spectacle. Wed 28th Aug: Tarangire National Park. Ngorongoro Highlands. Day in Tarangire with breakfast and lunch at the lodge. Discuss game drive options with your SENE guide (such as daybreak drive with return for breakfast, then a longer drive later in the morning). Depart after lunch for the Ngorongoro Highlands. In the late afternoon stretch your legs with a guided two hour light hike through the forested highlands inside the fabulous Ngorongoro Conservation Area, where a majestic 150‐meter waterfall awaits. Trek onward to visit the elephant caves, so‐called because the deep recesses in the valley wall are created by elephants digging up the earth to ingest the mineral‐rich soil. The rich soil also attracts buffalo, bushbuck, waterbuck, and baboons to the area. 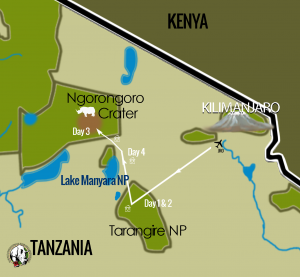 Thu 29th Aug: Ngorongoro Crater. Lake Manyara Region. Enter the famous Ngorongoro Crater for a day game drive in what is often referred to as “Africa’s Eden.” The descent into the crater, 2,500 feet below the rim, is an unforgettable experience. While only 100 square miles in area, it offers several distinct habitats: acacia forest, swamp, short grass plains, long grass plains, riverine, and woodland. Each habitat attracts a unique variety of the crater’s 30,000 resident animals that create a density and diversity of wildlife unseen anywhere else in Africa. Picnic lunch in the crater. In the afternoon depart the crater and descend to the Maasai Steppe surrounding Lake Manyara. Guided walk (30-45 mins.) by local Maasai to a viewpoint overlooking Lake Manyara for a bush sundowner. Fri 30th Aug: Lake Manyara Region. Arusha. Morning at Isoitok with breakfast and lunch. Visit a Maasai boma, taking a look behind the scenes to experience the daily living of the Maasai and learn about the social structure, marriage, and family roles and responsibilities. In the afternoon return to Arusha to see this commercial capital of northern Tanzania. Onward to Kilimanjaro Airport for flights homeward. Drive time to Arusha: 1.5 hours; onward to Kilimanjaro Airport: 45 mins. Private safari for KSR group. All activities, meals, accommodations, and transfers as indicated. Services of a professional English-speaking guide trained in East African wildlife and ecology. Park fees and unlimited mileage on game drives in fully-equipped 4WD safari vehicle with pop-top. Bottled drinking water in vehicle. Cold beverages and alcohol; activities on safari and at lodges that require additional charges; gratuities to trip leaders, guides, drivers, crew, or other staff; international airfare; airport departure taxes; additional accommodations made necessary by airline schedule changes or other factors; pre-trip expenses such as immunizations, travel insurance, passports, and visas; and any expenses of a personal nature, such as souvenirs and laundry. Accommodations listed in sample itineraries that SENE creates may not be available on requested dates, in which case we will find a suitable substitute, striving to match the standard of the original. We reserve the right to adjust the trip price if accommodations change. Trip prices are based on SENE costs, fees, and supplier prices in effect at the time of booking. SENE reserves the right to alter trip prices should inflation, cost of fuel, labor, materials, or exchange rates change. If the Tanzania National Parks Authority (TANAPA) raises park fees, or any hotel, lodge, camp, airline, or any other service provider raises their rates, SENE reserves the right to require additional payment from the client.